Google Me: Facebook-Killer or Another Johnny-Come-Lately? Is Google Building a Facebook Killer? Rumors have it that Google is building its own social networking site named "Google Me" that may be the company's attempt to unseat Facebook. Is it possible for the world's most popular search engine to wage war against the world's most popular social networking site? If speculations are true, there's a chance. The rumor started with a tweet from Digg co-founder Kevin Rose. 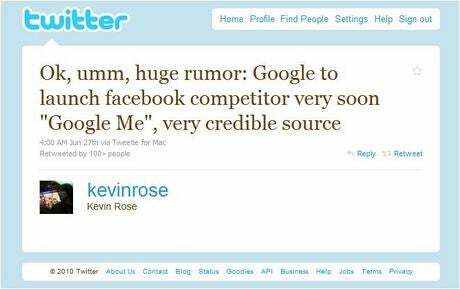 Citing a "very credible source" and carefully branding it a "huge rumor," Rose gossiped that Google plans on launching Google Me "very soon." That's it for details, but tech pundits turned Rose's 101 characters into elaborate plans. So what would Google Me be? A popular guess is that it will be an expansion of Google Profiles, which is a representation of how you appear on Google. Right now Google Profiles do not contain a lot of personal information, nor do they broadcast much. But they could. SF Weekly pointed out that Rick Klau, the developer who built Google Buzz -- Google's previous attempt at social networking -- was recently tapped to overhaul Google Profiles. If that's not a sign, I don't know what is. Due to massive privacy concerns (and lack of interest), Google Buzz failed. Buzz was released as an opt-out feature, meaning one day millions of people woke up to their e-mail contact lists splashed all over the Web. Google panicked and apologized for the error in judgment. It takes a lot of nerve for Google to attempt another social networking site. Infosyncworld sees the future of Google Me on mobile phones, specifically those running Google's Android OS. Location-based tracking is popular (and dangerous for one's privacy), so what better way to ride a fad than turning Google Me into the ultimate "I know where you are and what you're doing" kind of service? Google already has Latitude; meshing that with Me just makes sense. Google Me could also be more than just a friend-stalking time-waster -- it has the potential to become a immense productivity suite. Integrating Google Wave into Google Me could popularize document collaboration amongst friends and co-workers, and wouldn't require invitations but rather it could seamlessly combine the two services. As a standalone service, Google Wave is somewhat confusing, and many of its features were duplicated in Buzz. Pay attention, Google: incorporation is the key to success. Assuming these rumors are true, what would you like Google Me to be? Are you already concerned about your privacy? Is it possible that Google could be the David to Facebook's Goliath?